Building Characters for Life. That’s what we do at DreamWrights. Sure, we’re in the business of putting on performances, plays, and musicals. But what we do is so more than just that. We pride ourselves on being an educational theatre. One where anyone, regardless of age, race, experience, and background, can get involved. And, not only will we teach you how to act, sew, hang lights, balance sound, and create set, but also we will also arm you with tools to succeed in life. Through participation in our programs, we will teach you life lessons like responsibility, inclusion, self-confidence, the importance of community, and how our whole is greater than the sum of our parts. In addition to Our Miss Brooks, Terri has lent her talent to the sets of productions including The Adventures of Peter Rabbit, Peter Pan and Mary, It’s a Wonderful Life, Beauty and the Beast, and Babe, the Sheep-Pig. “I enjoyed working on the Peter Pan and Mary set the most. I had a lot of freedom to do what I wanted and I got to work with some of the younger kids who had artistic abilities and were interested. It was fun to work with them and show them different techniques. 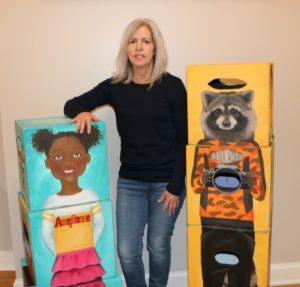 They really picked up on it quickly.” Terri also gives credit to Andrea Unger, her daughter Lilly, and other artists who helped her on the various projects. In addition to painting sets, Terri has made a couple of very special contributions to DreamWrights that are preserved even after the productions have ended. The first one is a beautiful mural that graces a wall of DreamWrights’ Director of Artistic Programming, Laurie Riffe’s office. “Laurie knew what she wanted and I just brought it to life.” Laurie says it is a beautiful reminder to her about why her work is so important. Being creative with the building blocks. 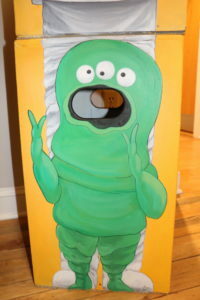 Why not turn the handle into an alien’s mouth?! 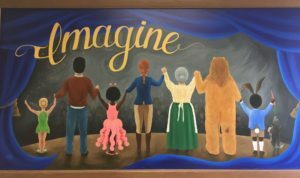 Terri’s most recent contributions currently are residing in our lobby, ready to help tell DreamWrights’ story of Building Characters for Life. 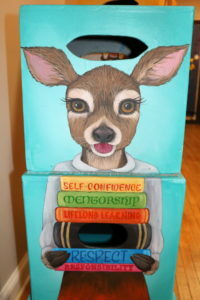 With an idea planted by Executive Director, Ann Davis, Terri created some beautiful and whimsical character building blocks. Terri says, “It was a lot of fun because I had to plan and be creative.” She says her biggest challenge was incorporating the handles that some of the building blocks had while trying to get all the sides to work together. 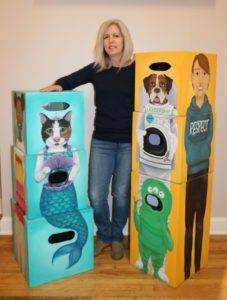 But thanks to Terri’s creativity, she turned the challenges into opportunities to add character elements, making the character blocks even more endearing. We invite you to stop by and see for yourself our character building blocks this May the 4th between 7am and 4pm as DreamWrights participates with more than 200 local non-profits in raising $1million dollars through Give Local York. We would love to give you a tour, show you where the magic of DreamWrights happens, and have you learn more about how DreamWrights teaches life skills. Oh, and we would love for you to consider making a donation to support our effort of Building Characters for Life. Thank you.